In the ancient Egyptian city of Cocodrilopolis, lived the Petsuchi, crocodiles adored as gods, adored with jewelry and goldware. They were called the "Sons of Sobek", Sobek being the Crocodile god of the Egyptians. In the video game Age of Mythology, Petsuchi are gigantic crocs that use a burning glass to obliterate armies. The burning glass is a large (in some cases very large) convex lens used to concentrate the light of the sun in a very small area, thus heating this area, and eventually, burning it (think of a child with a magnifying glass). The burning glass technology has been known since antiquity. You may remember from an earlier post, i wrote about the Nimrud lens, the oldest known lens, a piece of rock crystal that may have been used as a burning glass. The most well known use of a burning glass comes from the legend that Archimedes, the greek philosopher, designed and created a gigantic burning glass during the siege of Syracuse. Some people dissent form this belief, saying that it wasn't a burning glass, but a series of mirrors. One present use of Burning glasses are the solar furnaces used in smart homes and at certain isolated populations of Andine Peru. This use a set of mirrors placed parabolically to concentrate the sun's light on an object, sometime passing through a lens to further condensate the beams. Posted by Anónimo at 8:28 p. m.
Whenever you see through your SLR's viewfinder, or on your digital point-and-shoot's LCD screen, you are using one of humanity's oldest inventions: the lens. This last week, we've been very busy, focusing on photography and it's history, as well as the functioning of a typical SLR. We're now closing with the unknown basics of photography: how lenses work. A lens is an optical device that transmits, refracts, and concentrates light, as well as having axial simmetry, that is, it is symmetric around an axis, so if you were to rotate the object based on that axis, the appearance and form of the object would result unchanged. Lenses are divided into two categories: Simple lenses and Compound Lenses. A simple lens is formed by a single optical element, while a complex lens is formed by many different optical elements put together. The oldest lens in the world, the Nimrud lens, is over three thousand years old, and comes from Iraq (formerly Persia, formerly Assyria). It was simply a piece of rock crystal which may have been used as a magnifying glass, or as a burning lens. Lenses are regularly a portion of a sphere, with surfaces being convex, concave or planar. When a lens has two convex surfaces, it is called a biconvex lens. A surface with a planar and a convex surface is named plano-convex. A lens with two concave surfaces is called biconcave, and a lens with a concave and a planar surface is called a plano-concave lens. There's also meniscus lens, which feature a convex and a concave surface. Convex type lenses focus the light in a spot. Concave type lenses diverge light around an area. Meniscus lenses can be either positive or negative, depending on the thickness of the lens, and the difference of curvature between both lenses. Posted by Anónimo at 7:56 p. m.
It appears NASA needs another anti-virus software. Kelly Humphrey, spokeswoman for NASA stated that a virus was detected in the laptops used by astronauts in the International Space Station. The virus did not affect normal operations. The virus was described as a Keylogger worm, that searches for information (passwords, account numbers, personal information) to hackers and crackers across the internet. The virus was unable to do any harm, because the laptop computers aboard the ISS are not connected to the internet or Mission Control in Texas. El Batán es la única reminiscencia que se conserva de lo que fue el Obraje de Texcoco, propiedad de Don Antonio de Mendoza, Primer Virrey de la Nueva España. Hay que recordar que los Obrajes fueron los primeros talleres para la fabricación de telas para la confección de la ropa del personal que llegó de España y en especial de los frailes y del ejército español y en menor proporción para la hechura de la ropa de los esclavos de los mismo obrajes. El Batán surge como lugar donde se bateaban las telas de lana, fabricadas en Texcoco, propiedad de Don Antonio de Mendoza, quien fue el Primer Virrey de la Nueva España en los años de 1526 a 1545. La operación de batear las telas se hacía con el propósito de estirarlas y evitar que se hicieran bolas. Para tal operación las telas se sujetaban a un bastidor, se mojaban y se golpeaban con una tabla a manera de bate, de donde procede el vocablo de batán. En la Actualidad El Batán, se dedica a la cría y reproducción de caballos Pura Raza Española, engorda de ganado bovino y a la producción de forrajes como Maíz, Avena y Alfalfa. Posted by Unknown at 12:48 p. m.
El gremio del Sindicato de Directores Cinematográficos de México y la Cine-Fábrica de Redes* se complacen en invitar a estudiantes y profesionales del medio a inscribirse en el taller de creación de carpeta cinematográfica que se llevará a cabo en las instalaciones de la Sección de Directores, del lunes 22 al viernes 26 de septiembre de 2008. La fecha límite para la entrega de requisitos y el trámite de inscripción es el miércoles 17 de septiembre a las 13:00 hrs. Dirigido a gerentes de producción, realizadores forzados a producir sus expresiones artísticas, productores noveles y experimentados que todavía no se adaptan a las nuevas condiciones de producción, estudiantes de cine o egresados de la carrera de comunicación con aspiraciones de convertirse en profesionales de la producción cinematográfica. Requisitos Formato de inscripción, currículo completo y actualizado, conocimientos cinematográficos en cualquier escuela de cine o en la práctica, experiencia en la producción de corto o largometraje, televisión o video, conocimientos básicos de Excel y Word, preparatoria terminada y cubrir el costo del taller. *Cine-Fábrica de Redes, con un gran catálogo de cursos, es una empresa innovadora que surge con el fin de especializar a profesionales y técnicos del medio audiovisual. Posted by Unknown at 11:51 a. m.
Many people cite SLRs as bulky, noisy and complicated. The latter is not true, at least for anyone who reads the manual enclosed with the camera. The second point might just be true: SLRs are noisy. In fact, I rejoice in the noisiness older cameras. This post is all about the noisiness of SLRs, and why we love it! You now know about the mirror found between the film and the lens. But I didn't tell you about the focal plane shutter. The FPS is a photographic shutter that stops light from making contact with the focal plane (film or sensor) of the camera. Almost all SLRs feature horizontal double-curtain shutters. In slow shutter speeds, the opening curtain moves to the left, and after the necessary amount of time has passed, the second curtain (which has remained static) moves to the left side, thus, closing the focal plane again. When the shutter is recocked, both curtains move back to their starting positions, ready to be released again. In faster shutter speeds, the second curtain starts to close before the first curtain has fully opened. This creates a slit between both curtains through which light passes. As the speed of the shutter rises, the size of the slit becomes narrower and narrower, which allows some cameras to reach shutter speeds of up to 1/8000 of a second. The Double-Leaf shutter consists in 2 blades that are usually between or behind the lens. This system is used in the Kodak Retina Reflex series of cameras. This type of shutter synchronized with flash at most shutter speeds, and it became the favourite of studio photographers. All this brings us back to out first point: noisiness. The SLR has to do at least 6 things when the shutter is released: first, the mirror rises, shortly afterwards, the first curtain opens the shutter, and then the second curtain closes the shutter. All this motor moving and closing and opening rattle is what makes an SLR take neat exposures. Posted by Anónimo at 3:19 p. m.
The above is binary code. If you were a computer, you'd find out the number spells out the word "Photography". That's what this post is all about: digital photography. Assuming that you live in this hi-tech world, in which we use the internet and read Multimedia blogs on Google-owned Blogger.com, then you must know what the definition of digital photography is. Nonetheless, I'll tell you that Digital Photography is a method of photography which uses numerous electronic devices to record and store an image in the form of binary data. The story of digital photography can be traced all the way back to the first scanners, to the late 1950's. In 1957, a team, working for US National Bureau of Standards and led by Russell Kirsch, developed the first Drum Scanner. Drum Scanners use a PMT (photomultiplier tube), a vacuum tube that captures light, transforms it into electrical energy, and then amplifies it. Then, in 1969, the Charge-Coupled Device (also known as CCD) was invented by Willard Boyle and George Smith. A CCD is a shift register, a device that transports analog signals in the form of electric charges through various capacitators. In a broad sense, a CCD is not an image sensor, but the way the sensor's information is transformed into digital information. CCD's first planned use was as a form of memory storage device in computers. However, shortly after it was invented, it was learned that CCD's could receive charge via the photoelectric effect. In 1981, the Sony Corporation introduced the Mavica, a still camera which featured two-CCD's, and stored the images in a two-inch floppy disk. One of the CCD's captured light information, while the other captured chromatic information. In 1986, Kodak scientists invented the world's first megapixel sensor, capable of recording 1.4 million pixels that could produce a 5x7-inch digital photo-quality print. In 1987, Kodak released seven products for recording, storing, manipulating, transmitting and printing electronic still video images. Posted by Anónimo at 6:44 p. m.
La investigación de mercados contemporánea es un cruce de caminos que va desde la estadística y el psicoanálisis hasta la neurociencia, la etnografía y la semiótica. El propósito es poder entender mejor, holísticamente, a las personas cuando actúan como consumidores. Sabemos que detrás de cualquier conducta de mercado hay un complejo de juicios y sentimientos que la desencadenan. Hemos dedicado nuestro XV Congreso Anual a revisar hallazgos, hipótesis y evidencias sobre la forma en que podemos entender y diagnosticar el mecanismo racional y emocional que hace que un consumidor aspire, perciba, compre. Photography has a pleasant je ne sais quoi to it, a way of transmitting feelings in a way other art forms- cinema, painting, poetry, dancing, and etc- fail to transmit. Maybe it’s the fact that, to see a photograph, one does not need to have certain specific traits, like a vast vocabulary or having a massive visual sensibility to understand what exactly does Edvard Munch’s The Scream tries to tell us. Maybe it’s the fact that, it has a way of freezing time cinema or video can’t offer. In my previous posts, I’ve written about the historical development of photography, all the way back to Ibn Al-Hazen's Camara Obscura, and to more recent times, stopping at the huge development Japanese Optics Corporations had in the 1950's. I'm gonna take a break from the whole history lesson for now, and we'll start on engineering and physics, as to fully understand the way a Single-Lens reflex camera works. A Single-Lens Reflex camera allows the user to see, throught the viewfinder, the way the picture is to be taken. A mirror is set between the sensitive surface (sensor or film) and the lenses. The mirror is placed at a 45° angle, which makes the light beams, waves, or particles (whichever way you want to see it) travel upward, and hit a focusing screen. The image is proyected on the focusing screen. 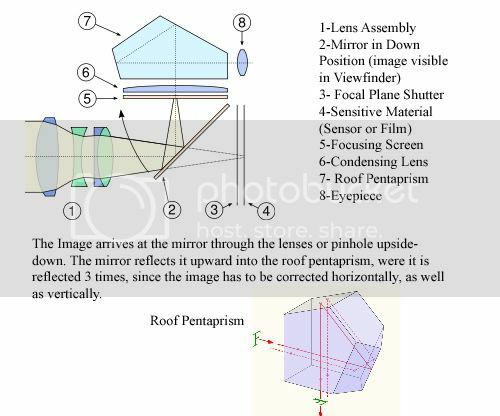 A roof pentaprism reflects the proyected image 3 times: The first reflection corrects vertical orientation, the second one the horizontal orientation of the image, and the third one reflects the image the way it is seen through the viewfinder. Generally, to add brightness to the image in the viewfinder, there is a condensing lens found between the focusing screen and the pentaprism. Since the faces in a pentaprism cannot ensure Total Internal Reflection, given the entry angle of light, both reflective surfaces of the pentaprism have to be coated or overlapped with a reflective material. In early SLRs, the mirror had to be lifted manually before a picture was taken. This made the SLR unpractical and useless for certain photographics tasks. When automatic mirror-rising was introduced, a new problem was born: the vibration caused by the mirror-lifting caused motion blur. Then, in 1959, the Nikon F introduced mirror lockup. Mirror Lock Up allows the mirror to be raised before the Shutter is opened. The vibration dies down , and no motion blur appears on the exposure. Posted by Anónimo at 5:47 p. m.
Japan had been doing optics for some time then. Pentax (or Asahi, as it was then known) had military contracts for optical instruments during WWII. At the end of the war, the company was disbanded for three years, when in 1948 it was allowed to re-form. In 1952, Asahi released the Asahiflex I, the first Japanese 35mm SLR. In 1954, the Asahiflex IIB became the first Japanese SLR with a return mirror. By the end of the 1950’s, the SLR design was homogenized. In May 1959, Canon introduced the Canonflex. The Canonflex featured a quick return mirror and an automatic diaphragm ("with Automatic Springback Diaphragm and Mirror"-1959 Canon Brochure). It was also the first camera to have Canon’s breech lock FD mount. In theory, the system made any mount a secure one. You only had to tighten the breech. When in practice, though, this turned out to be unpractical, since more time had to be devoted to attaching or removing the lenses. The Canon FD mount was used until 1987, when Canon introduced the EF lens mount, to be used with the Canon EOS cameras. 1- An interchangeable prism and focusing screen system. 2- Mirror lockup, which reduced vibration, by making the mirror flip out of the light’s path just before the shutter opened. 3- A solid design, making it resistant to damage. 5- It was released with a wide variety of lenses, ranging from 21mm to 1000 mm focal length. Minolta released the SR-2 to global market the same the Canonflex and the F, although the SR-2 had been on sale in Japan since 1958. The SR-2 featured Minolta’s MD mount (still used today) along with a semi-automatic diaphragm. Posted by Anónimo at 12:20 p. m.
Photography could only be made via the Daguerreotype and Collodion process exposure systems, both of which were unpractical, and required the photographer to carry a box full of toxic or potentially flammable substances around, along with the plates on which the photography was to be taken. In 1884, George Eastman created the first photographic film with nitrocellulose coated with a dry gel emulsion of silver halide salts. In 1888, Eastman introduced his Kodak Camera, along with the famous slogan “You press the button, we do the rest”. This was true: the roll of film meant anyone could take a picture, without having to develop the picture almost immediately. In fact, the whole development process could be made by someone else. In 1901, Kodak introduced the famous “Brownie” (Henri Cartier-Bresson’s childhood favorite). The first Brownie was a simple box camera, made of cardboard, and with an initial price of $1 dollar. In 1913, the 35 mm film format was introduced for still photography. The format was created by Thomas Alva Edison as a way to feed film into a camera through sprocket holes, when all other cameras used friction feed. Edison patented his invention, forcing his competitors to use friction feed until 1902, when a court ruling invalidated Edison’s claim, allowing any producer or distributor to use the film design without a license. The new film format was practical and smaller than other film designs, but wasn’t popular until Leica Camera introduced the Leica I, or Leica A, a precision miniature camera. The 35 mm snapshot camera design introduced by Leica has not changed much in more than 80 years. But the next great milestone in photography came in 1936. Single lens reflex cameras were invented 1861 by Thomas Sutton. The sole design of the SLR had been around for more than two centuries before photography was born: Artists would use Camara Obscura fitted with a mirror placed in a 45° angle, which would reflect the image into a ground glass, allowing the artist to make a realistic drawing by simply tracing over the glass. Early SLRs were large format cameras, and not as popular as the standard View Cameras of the time. They had waist-level viewfinders, and the mirror, most often than not, had to be raised manually before the picture was taken. In 1936, Dresden-based Company Ihagee released the Kine-Exakta, the first 35mm SLR. Between 1936 and 1937, Zeiss started working on a 35 mm SLR. The camera used an eye level pentaprism, which allowed the image to be seen in a correct left-to-right orientation, since waist level cameras showed a reversed image. Additionally, a Fresnel lens was placed in between the ground glass and the pentaprism, thus brightening the image. This design became the conventional SLR design used today. The camera wasn’t introduced until 1949 as the Contax S, mainly because all production halted when World War II intervened. Posted by Anónimo at 6:28 p. m.
The word photography comes from the Greek words phos (light) and graphis (brush). And that’s exactly what photography is all about: Drawing with light. Photography is a complex art, being the result of a series of technical discoveries from several different disciplines. Photography involves math, physics and chemistry. The first “photographic” device known to humanity is the Camara Obscura. Although the Camara Obscura had already been around for a while, it was Ibn al-Haytham, an Arab philosopher, who described it thoroughly in his Book of Optics (circa 1000 a.D). It was simply a box, with a tiny hole in it. The hole would let a small portion of light into the box, and strike a specific part of the back wall, usually a piece of paper, on which the artist would copy the image. As the hole got smaller, the image also became sharper, but more light would be needed (depth of field). Then, Silver Nitrate and Silver Chloride were discovered in the 12th and 16th century, respectively. Silver Nitrate is the precursor to other silver salts, and Silver Chloride is the “magical” substance from which photographic film is made, since it turns from white to metallic- black/gray via photoreduction. Finally, in the mid-1820’s, Nicéphore Niépce, a French inventor, created the first “photograph”, and 8-hour exposition from a window in Le Gras. He named this new process “Heliographie” or “drawing with the sun”. Shortly afterward, the term Photographie was used by Hercules Florence, a French artist, to name a process similar to Niépce’s. Meanwhile, William Fox Talbot, an English inventor, had discovered yet another process to create images from a silver salt-based process. Upon reading about Niépce’s invention, Talbot made some adjustments to his process to take faster expositions to be able to photograph people. John Herschel, another English inventor refined Talbot’s negative image process (called calotype) and created the cyanotype, or blueprints. He discovered sodium thiosulphate solution to be a solvent of silver halides in 1819, and informed Talbot of his discovery in 1839 that it could be used to make pictures permanent. In 1851, an article, written by Frederick Scott Archer, appeared on “The Chemist”. The article reported Scott’s findings on the Collodion wet plate process. Collodion is a nitrocellulose solution in ether, which happens to be also toxic and extremely flammable (another name applied to Nitrocellulose is the word “Guncotton”, because it can be used as a projectile driver, with 6 times the gas generation of black powder (in his book From the Earth to the Moon, Jules Verne’s mega cannon Columbiad uses guncotton to propel a cylindroconical projectile to the Moon)). The discovery of the Collodion process disposed of the albumen process on glass plates, and made the time of exposure shorter. The new process required the projection surface (glass) to be cleaned extremely well. Then, the glass would be flowed with salted Collodion, after which, the glass would be immersed in a silver nitrate solution for about 5 minutes. The plate was then ready to be exposed, and the developed in an iron-based developer. The plate was then fixed with the exposure, and varnished with a mixture of gum sandarac, alcohol and lavender. This process had to be done within minutes of each other, which meant a photographer carried the chemicals wherever he went. It is quite extraordinary there are no reports of a photographer dying in a guncotton related explosion, or from silver nitrate-related poisoning. Then, in the late 1880’s, the dry collodion plate was introduced to replace the wet plate. By 1884, the film process was created, but it was years before it was adopted as the standard exposure process. Posted by Anónimo at 6:20 p. m.
Bienvenido a mi página de producción y renta de cine y video digital de alta definición 'High End', ya puedes producir y rentar con nosotros con la increíble Sony HVR-Z7 con lente Carl Zeiss intercambiable y grabación simultánea en cinta y tarjetas de memoria, disponible con accesorios Dolly y Steadicam opcionales." Posted by Unknown at 1:47 p. m.